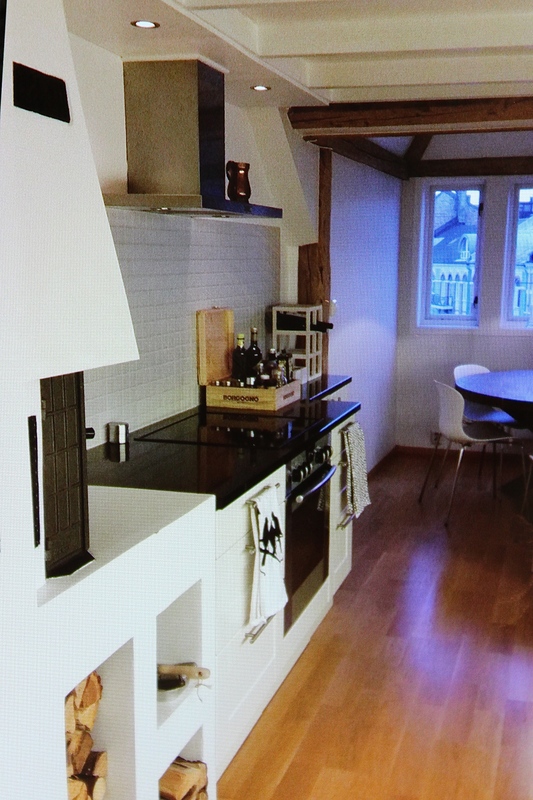 Note the wood-burning fireplace on the left — pizza oven, anyone? The landlord/owner is clearly a cook. He left behind a great set of knives, pots and pans, crystal, dishes, small utensils, and even a food processor. Of course, being as I also love to cook, my first agenda of business was to take inventory and make a list of any missing supplies that would need to be purchased — nuthin’ I love better than stocking a kitchen. Cookie trays, mixing bowls, rolling pins, etc., went on the list for my excursion to Ikea, the place most Norwegians shop for household goods. But more about that in my next post…. Surveying the pantry came as a bit of a surprise. The landlord had left behind a selection of flours, rices, teas, and spices, along with an invitation for us to use as much as we needed. Perusing through the shelves, it suddenly dawned on me that not knowing Norwegian was going to be something of a handicap when it comes to cooking. Everything is packaged differently (i.e. mayonnaise and tomato sauce comes in tubes), so it took a while for me to recognize exactly what I’d inherited. Translation: chives, tarragon, cumin, cinnamon, ginger. My favorite are the various words for tarragon. Sounds like I’m flavoring with either dragon or estrogen. 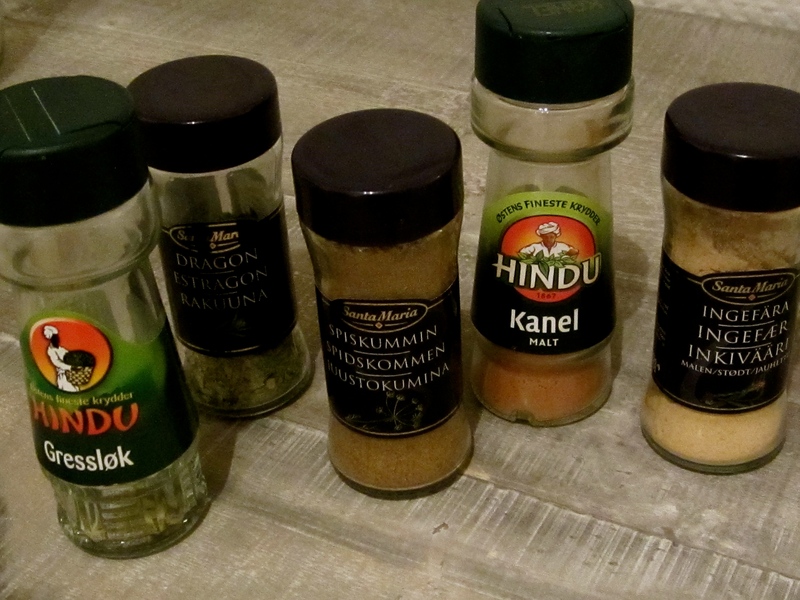 The spices alone had intimidating and frankly unappetizing names like Gressløk, Urtegard, and Lagerblad, which sounded more like ingredients in one of Professor Snape’s potions. Google Translate didn’t provide any clues, and the drawings on the labels didn’t help much either. When smelling the contents proved equally mystifying, I decided it was time to go grocery shopping. My first stop was the green grocer on the corner (see top photo.) Easy pickins here, as a fresh tomato is easily recognizable, thus saving me the hassle of translating. And I have to say, the quality of the produce was really quite spectacular. About eight different kinds of lettuces flirted with me, waving curly leaves crisper than any I’d ever seen back home. Stacks of boxes stocked with an astonishing variety of woodsy-smelling mushrooms testified to the Norwegians love of foraging, while four different species of carrots and twelve different kinds of potatoes spoke to the staples found on most Norwegians’ daily dinner plates. 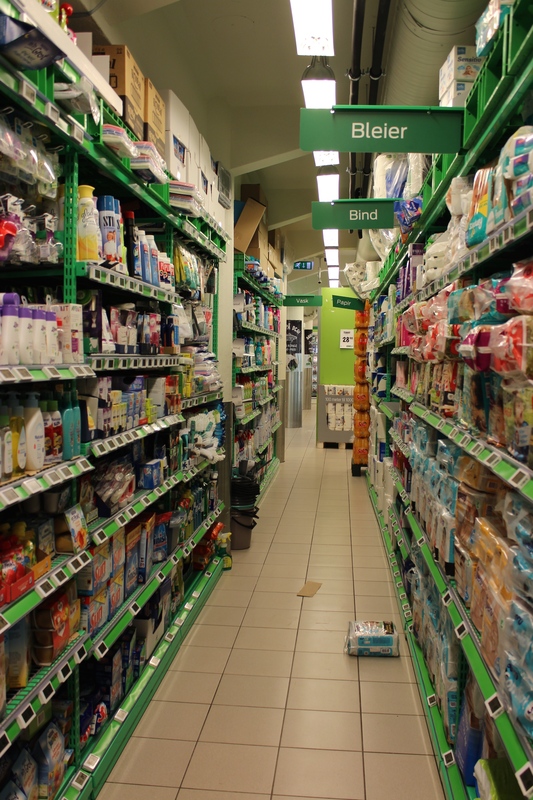 Compact grocery stores tend to go vertical, making ample use of every available space. While oils and vinegars were plentiful, dry goods were a bit scanty, so I moved on to ICA, the largest grocery store in my neighborhood (although quite compact compared to U.S. megastores.) The foreignness of many of the products, enhanced by the packaging and labeling, left me feeling a little overwhelmed. When confronted with ten different bags of flour (mel), all sporting the same drawing of wheat (hvet), but in various psychedelic colors, I realized I needed help and flagged down a passerby. Most Norwegians speak excellent English, but having some acting skills can help clinch the communication. So in this instance, my imitation of rising bread helped seal the deal on separating self-rising from all-purpose flour. Next came dairy. I learned my favorite word of the day from a sweet man who explained that smør (pronounced something like “smoooor,” but with a really flat “o”) meant butter, but was also used to describe nasal spray, as well as the table used to apply wax to skis (a smørebord or “buttertable”). Then a lovely couple spent ten minutes with me looking for the equivalent of buttermilk, after I pantomimed churning butter and explained that I was looking for the leftover milky stuff. The meat department became a communal adventure, with no less than seven people all engaging in a game of charades as I tried to explain “chicken stock” and they pantomimed back different ages and genders of chicken. Yep, that’s right. The woman who finally won the game explained that the kind of stock I was looking for was made from “an adult female chicken, how you call it — a hen? Not a regular chicken.” Still confused about that one. Finally, two hours later, it was time to check out. The $150 price tag attached to the meager ingredients necessary for making chicken-and-dumpling soup made me blanche, but I’d been expecting it. (Norway is the most expensive country in the world to live in right now.) But then the cashier asked me if I wanted a pølse. “What would I want with a hot dog?” I thought. “Is it a freebie with purchase?” So of course I said yes, and she handed me a plastic bag (a pose) — not free, by the way, since most Norwegians bring their own bags. This just illustrates the fun of trying to speak and understand Norwegian, which has 19 different dialects. But that’s a story for another day…. Previous PostThe Move: Round INext PostHop on the Ikea Bussen! Let’s just say my pantomime involved puffing out my cheeks and belly like I was swelling up, and then pointing to bags of flour with a questioning shrug. Very attractive to witness I’m sure. And super fishy stuff is big in Norway, too — some I like, some … not so much. More blogs with big photo galleries coming shortly. Stay tuned!